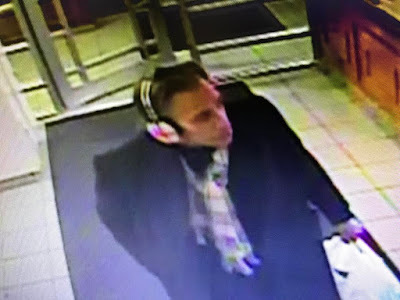 An EVG reader reports another package theft (see previous posts here) ... this time from a lobby on Eighth Street between Avenue C and Avenue D.
The building's surveillance video (below) shows the suspect entering the building. He put a scarf over his head and left with a bagful of boxes — a number believed to be seven or eight. According to the reader, he slipped in when someone making a food delivery left the building. Per the reader: "I hope he enjoys my infant swim diapers." Is it true Amazon other online retailers will send a replacement for free if stolen? Landlords get busy setting up a secure package room, container, or locker so you tenants are not ripped off each day. Yes, insurance covers theft if they cannot prove that you signed for the package. We have had close to a dozen packages go missing in the building in the past few weeks. Some people think it is the Seamless and Postmate app food delivery guys with the giant backpacks talking stuff with them on the way out. Others think its the AirBnB people doing their own version of holiday shopping. So far the thieves got a free iPad, an expensive digital SLR camera, and a nice comfy microfleece zip up jacket. And if I see them wearing it, they’re finished. More like packages theft. Scum bag. new york still has brick and mortar shops...for now. no need to go to amazon. This is so sad, I get lots of things from amazon and Lands End that are very specific to my needs and nobody would have much use for and are not expensive. 4 lbs of chia seeds, a cheap humidifier, large expandable waist pants. You could not get much more than a dollar for them on the black market. A thief has nothing to lose when he or she picks up a package, it's like being in that old school game show "Let's Make a Deal" however you get to open all the boxes and keep everything. Don't forget about Amazon lockers -- which now also benefit from free shipping for orders over $25. Everything else can go to East Village Postal (151 First Avenue) where you can pick it up at your convenience for $5/package -- small business brick and mortar for the win! @Donnie Moder: Why would you cyber-order chia seeds when they have them by the bag and in gravity bins in any number of stores in this neighborhood? Is it that you get a thrill out of paying shipping and handling? But especially: a dollar a day to rent a secure mailbox is a pretty good deal—unless you're expecting to move into a doorman building any day now and just don't know when.